A case has been filed accusing 20-25 unidentified men on Sunday night with Tongi Police Station over Saturday’s clash on the bank of the Turag River in Tongi. The case has been filed for obstructing police from performing their duties and attacking them during clashes between two factions of Tabligh Jamaat on the day. Officer-in-Charge (OC) of the police station Emdadul Haque has confirmed the news. 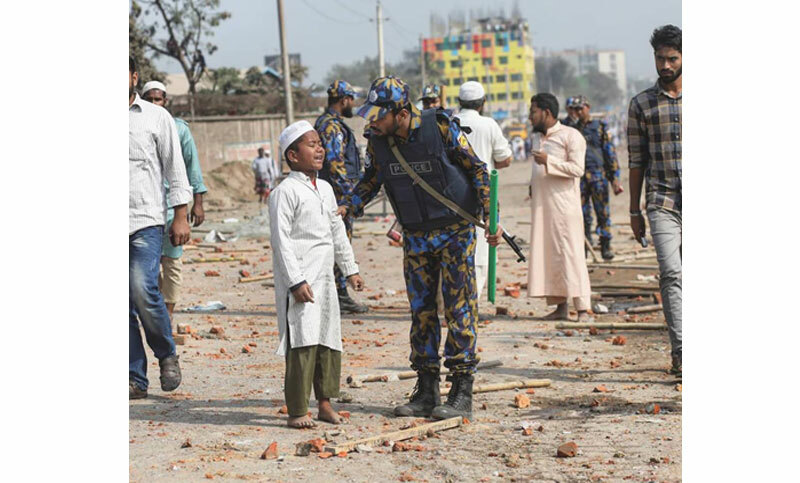 At least one person was killed while over 200 others were also injured in a series of clashes between two factions of Tabligh Jamaat for establishing control over the Ijtema Maidan in Tongi of Gazipur. Earlier, mentioning that the date of Biswa Ijtema, the second largest congregation of Muslims after the Hajj, will be fixed after the national election, Home Minister Asaduzzaman Khan yesterday said no gathering will be allowed at the venue until then. Home Minister Asaduzzaman Khan Kamal also said that the decision was taken at a meeting with the representatives of two factions of Tabligh Jamaat held at the Home Ministry. The meeting was convened following the clash between two groups of the Tabligh Jamaat. “All kinds of religious gatherings or rallies will be restricted on the Ijtema premises and law enforcers will guard the venue,” he also added.